It is roughly estimated that 67 million households inside the US have household pets. Taking into consideration that a great number of households have pets, accidents will happen and pet stains on your carpeting will result. At OxiGreen in Levittown, PA, we hope the tips in this post can help you avoid making a mistake when attempting to remove spots on your carpet. Here are our suggestions. • Whenever trying to remove a spot in your carpet, it's best to respond right away while the stain is fresh. New spots acted on promptly have a 75% greater likelihood of getting the stains removed. • Since heat can set a stain, make sure the spot is totally eliminated before making use of an iron or hair dryer to dry it out. • Before you do anything, be certain that you remove liquid stains by blotting or solid blemishes by scraping them away from the carpet. • Liquid spots can often be removed with a wet/dry vacuum if you have access to one. • We cannot stress this enough, make sure that you are extra careful not to do something may possibly spread the stain in that area. • When using chemicals to eliminate spots, be sure to first test the spot remover on a spot that is hidden, like a closet, before attempting it on the spot. This extra measure of extreme caution should help to be sure you don't end up damaging the carpet or rug fiber or discoloring the carpet. Because it is out of sight, you can attempt a different spot removing chemical until you come across exactly what will work without damaging the visible areas of your rug. • Work at all times from your outer borders toward the middle when using a spot removal solution. Warning: don't scrub or scour the carpeting using a hard-bristled brush. Also, do not grind the towel you are using into the spot either. Blot gently by means of downward pressure on the region where the stain used to be. • Make sure that you wash off chemical spotters entirely with water. Blot the region all over again until it is as dry as you'll be able to get it. When you're getting rid of spots on upholstery or carpeting, try using an absorbent pad or a couple of towels to dry out the area by weighing them down with books or some other heavy item. The more time you keep this in position the more moisture content you'll get out of the carpet. Some blemishes can be removed using this do-it-yourself approach, but whenever you need to have professional assistance, call OxiGreen in Levittown, PA for help. OxiGreen has many years of professional experience dealing with the most difficult spots you can imagine. Our years of expertise make us certified to safely and effectively get out virtually any spot. 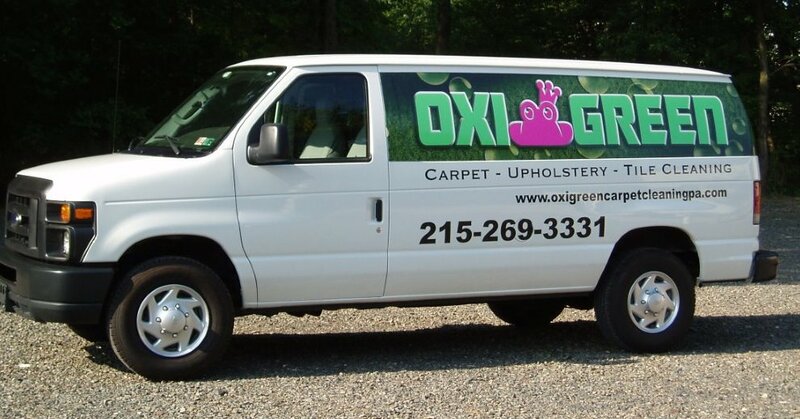 For prompt stain treatment call OxiGreen at 215-269-3331 in Levittown, PA today! We can easily assist you with all your carpet and upholstery stains, general carpet cleaning and carpet repair and stretching. OxiGreen in Levittown, PA is equipped to give you the results you want, so call us today!